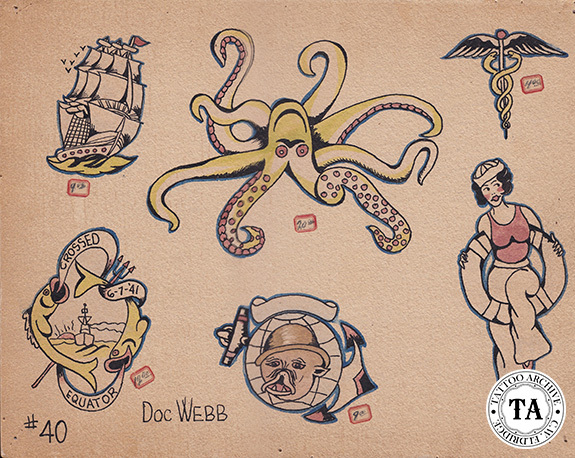 Doc Webb said that he got his first tattoo supplies from Charlie Wagner in 1926. He ordered two machines for $5.00, and when they arrived they were in pieces, with no instructions for assembly. Doc wrote Wagner for help and Wagner replied, "if you do not know how to assemble them, maybe you shouldn't have them"! 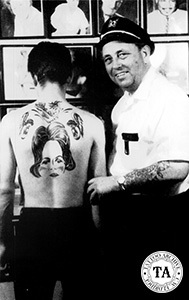 Needless to say, the first machines Doc tattooed with were made by Percy Waters. Doc summed it up well in his book, The Honest Skin Game where he said, "Tattooing has been a great experience, a never-ending joy. I've seen life, and more than half of the world. The little tattooer's buzzer made it possible. Each day, I eagerly look forward to what will come, and am as thrilled with the job I do today as I was with my first tattoo. I take photos of some of my work, and put it on the wall for all to see. I'm like the little kid bringing home a picture he drew, saying, 'Look Mom, what I did today'." Doc Webb died in 1986.